Following a whole lot of speculation of a Plant-less Led Zeppelin tour, Jimmy Page's manager today (January 7) confirmed that the band would hit the road with a replacement singer, as well as record a new album. 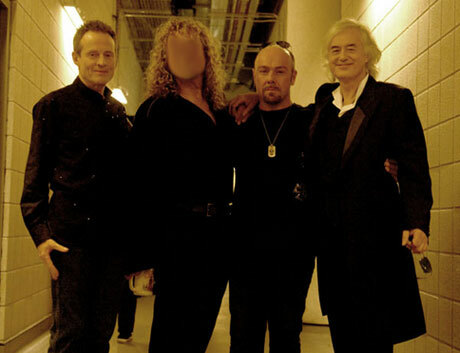 Despite the three surviving Led Zep members - Robert Plant, Jimmy Page and John Paul Jones - playing a reunion show in 2007 (with drummer Jason Bonham filling for his late father John), Plant has denied any interest in any further reunion activity. However, Page's manager Peter Mensch said today the group would continue with or without Plant, or at least if they could find a suitable replacement. "People don't really understand it," Mensch told BBC 6 Music, "Jimmy Page has been playing guitar professionally since he was 16 years old. Jimmy Page likes being a musician. That's what he does! He doesn't want to be a race car driver or a solicitor. "So they [Page, Jones, Bonham] did the show with Robert Plant; they had a really good time rehearsing, the three of them, before Robert showed up. And they decided that if they could find a singer that they thought would fit their bill - whatever their bill was at this stage in their career - that they'd make a record and go on tour. "And I support that because, why not? That's what Jimmy Page does. That's his job, his hobby, his vocation. They decided if they could find a singer that they thought would fit their bill ... that they'd make a record and go on tour." However, Mensch has not yet named any replacement singer, causing rumours to pop up everywhere that Led Zep's new front-man could be anyone from Soundgarden's Chris Cornell to Aerosmith's Steven Tyler to Jack White to Myles Kennedy, the dude who replaced Scott Stapp when Creed threw in the towel. "It's gonna be a long a difficult process," Mensch said. "And we're not soliciting people! So don't call me about it!"